Western blot analysis of extracts from various cell lines using YTHDC1 (E2P2I) Rabbit mAb. Immunoprecipitation of YTHDC1 from HCT 116 cell extracts. Lane 1 is 10% input, lane 2 is Rabbit (DA1E) mAb IgG XP® Isotype Control #3900, and lane 3 is YTHDC1 (E2P2I) Antibody. 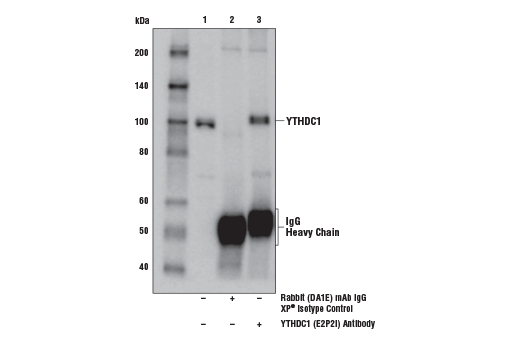 Western blot analysis was performed using YTHDC1 (E2P2I) Rabbit mAb. 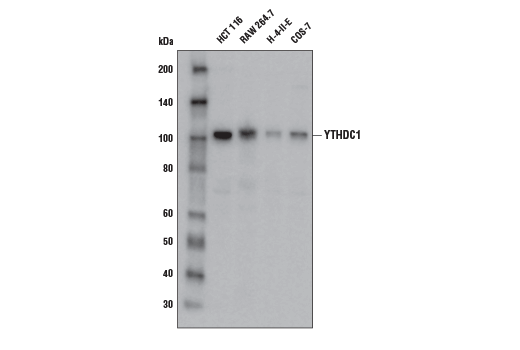 YTHDC1 (E2P2I) Rabbit mAb recognizes endogenous levels of total YTHDC1 protein. Monoclonal antibody is produced by immunizing animals with a synthetic peptide corresponding to residues surrounding Gly11 of human YTHDC1 protein. YTH domain-containing protein 1 (YTHDC1) and YTH domain-containing protein 2 (YTHDC2) both belong to a family of proteins that bind to RNA. YTHDC1 and YTHDC2 both recognize and bind to N6-methyladenosine(m6A)-containing RNAs; binding is mediated through the YTH domains (1-3). m6A is a modification that is present at internal sites of mRNAs and some non-coding RNAs and plays a role in regulating mRNA splicing, processing, and stability. YTHDC1, also known as splicing factor YT521, regulates alternative splicing by functioning as a key regulator of exon-inclusion or exon-skipping. YTHDC1 promotes exon-inclusion by recruiting pre-mRNA splicing factor SRSF3 to regions containing m6A, while repressing exon-skipping by blocking SRSF10 binding to these same regions (2). Increased expression of YTHDC1 promotes malignant endometrial carcinoma (EC) through alternative splicing of vascular endothelial growth factor A (VEGF-A), resulting in an increase in VEGF-165 isoform and increased EC cell invasion (4). YTHDC2 functions to enhance the translation efficiency of target mRNAs and may play a role in spermatogenesis (5). Xu, C. et al. (2015) J Biol Chem 290, 24902-13. Xiao, W. et al. (2016) Mol Cell 61, 507-19. Xu, C. et al. (2014) Nat Chem Biol 10, 927-9. Zhang, B. et al. (2015) Tumor Biol 37, 15543–15549. Hsu, P.J. et al. (2017) Cell Res 27, 1115-1127.